Beijing 2012: Lamborghini Urus SUV | What Car? 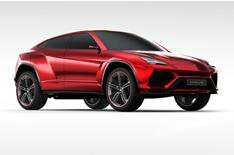 This is the Lamborghini Urus an SUV concept car that makes its debut at the 2012 Beijing motor show. Lamborghini has a history of building SUVs, having produced the LM002 between 1986 and 1992. It describes the Urus as a very concrete idea for the future of Lamborghini, so a production version is likely. At 499cm long, the Urus is 14cm longer than a Porsche Cayenne, but its 5cm lower. The body includes a number of carbonfibre elements to keep weight down, while the 24-inch alloy wheels have winglets to improve ventilation. Carbonfibre is used extensively throughout the cabin, including the four bucket seats, while controls are kept to a minimum, thanks to a large touch-screen system on the centre console. Lamborghini hasnt revealed any technical details beyond stating that the Urus has permanent four-wheel drive, a dual-clutch transmission and a power output of around 590bhp. That could suggest a tweaked version of the Gallardos V10 petrol engine. A production version which might not retain the Urus name is expected to share parts with a new Bentley SUV previewed by the EXP 9F concept car at the 2012 Geneva motor show, and also the next Audi Q7 and Volkswagen Touareg. It's unlikely to go on sale before 2015.